If cars could fly, imagine how the typical driver as you see them today would fly a car. Traffic could go up and down in full three dimensions rather than either way down a highway with left and right turns. There may be safer drivers considering what could happen, then again, some people seem destined to remain horrible drivers regardless of the consequences. Learning to drive would be much different if cars could fly. The process may seem similar, but the teacher would need far more potential control over the car should a student not show much process during their first attempt. The idea of taking your children to a large empty parking lot to teach them yourself would no longer be a possibility. Imagine trying to learn to use a stick shift in a flying car, that would be a scary process even at fairly low learning heights of about ten feet above the ground. You might imagine distracted driving would become a thing of the past but then again, probably not. Somebody would be late for work, trying to eat a sandwich and drink coffee while on the phone explaining their tardiness. Somebody else would be upset by a bug on their windshield and swerve all over the road trying to remove it. The consequences of distracted driving are already bad enough, yet people think they can handle all sorts of tasks at the same time as driving. Certainly, some driving fliers would think their just so awesome they can do whatever they want while flying. Imagine trying to find a parking spot in a three dimensional parking lot. Without fail, as you see an open front row space and fly toward it somebody would cut you off to get there first. Not only would people cut in front of you with a quick right or left turn, but up and down turns as well. The question arises, would you back out or back down to leave a parking spot? If nobody parks in the space above you, would you go straight upwards to leave the spot? As a matter of fact, how would you orient the car, would park it pointing straight up and down for quick and easy egress or just pull straight in and worry later about backing out of the spot? Regular car maintenance would likely be more common. Cars that aren’t maintained would be fairly efficiently eliminated from the road as a breakdown would entail falling 50 feet out of the sky, effectively destroying even the sturdiest and most rugged of vehicles. There would likely be an occasional smog path following a car with a piece of rope tying the hood down, but the problem would soon correct itself. Mechanics might require additional training, but after falling 50 feet because of a breakdown you probably wouldn’t be in a condition to file a formal complaint. Imagine O.J. Simpson heading down the airways refusing to stop for police if cars could fly. It would look like a flock of geese heading south for the winter with a couple of ugly ducklings in tow. There really wouldn’t be any safe way to end a chase if someone refuses to stop. Nail strips wouldn’t work because fling cars don’t need tires. A bump to edge a driver off the road or disable the flying car wouldn’t work as the police officer would likely suffer as much damage and injury as the offender. Perhaps police cars could have an automatic remote cutoff switch to force cars to stop flying away from them before making them relearn basic driving skills from an online traffic school. 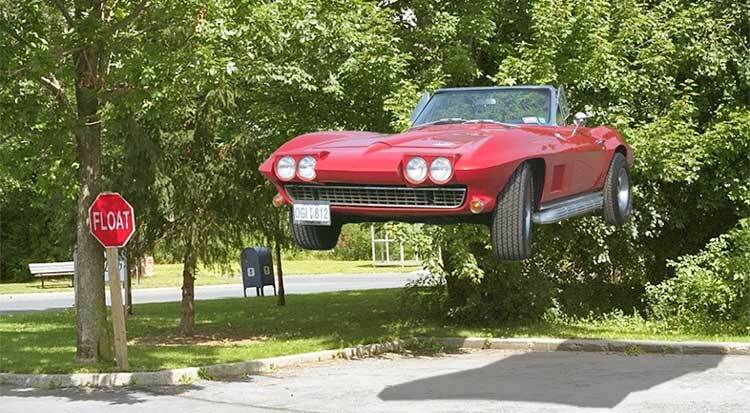 All told it would be a different world if cars could fly. But judging by the traffic you see on the road today, traffic above the road would consist of equally bad drivers. People would still have need for an online traffic school to learn safe, effective and defensive driving techniques.